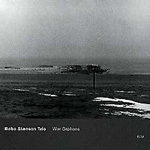 The title tune is by the fairly obscure composer/arranger Gordon Jenkins, which was used by Benny Goodman to close his shows, and comes as close to a standard ballad as anything else Stenson has recorded, while once again, the emotional and music kernel of the piece is exposed and brought to the surface. 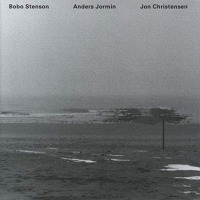 Stenson and Jormin demonstrate they know each other, and Motian slips effortlessly and forcefully into the roll that Christensen filled for so long. This is true trio music where the whole is definitely more than the sum of the parts, which nevertheless remain distinct. 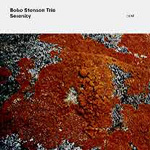 Containing more than ninety minutes of music on two discs, Serenity is simply astounding. Stenson's trio has created a lake that is so deep and wide, yet crystal clear, it would take weeks to fully explore. The overall mood is quite subdued yet tension and intensity are always lurking beneath the surface, as with Jormin's "T" and immediately followed by four short, abstract, free "Prints," which start Disc 1. Instead of choosing an Ornette Coleman tune, this time Stenson picks Wayne Shorter's "Swee Pea" (from Super Nova), which in its original form is an eerie wisp of a tune, but here is introduced by faint percussive effects by Christensen leading to Jormin's arco playing that almost voices harmonics on every note, echoing Shorter's mournful soprano. The bass vamp that is set up threatens to take off, but never does, and Stenson's playing just barely adds to the melody. On Disc 2, Silvio Rodriguez is revisited by "El Mayor" (the first time was "Oleo de mujer con sombrero" from War Orphans). The core of the disc could arguable be said to be "Die Nachtigal" by Alban Berg, "Rimbaud Gedicht" by Hanns Eisler and the title tune, "Serenity" by Charles Ives. The Berg line is made to almost feel like a waltz as it drifts in and out of a subtle triple meter and becomes almost a song; one can almost see Berg smiling, saying, "Yes, that is how my music should be played." Eisler, who is also represented on Disc 1, has his tune supported by an intense Christensen on snare and cymbals as Stenson and Jormin let it sing out. Ives is hardly the stuff of what is normally considered jazz material, but here is used as grist for the Stenson/Jormin/Christensen mill with each player contributing to an ethereal sound, each taking the lead at different times. Serenity is to be sipped slowly and thoughtfully. 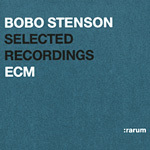 The :rarum series enables an ECM artist himself to choose tracks from his whole career and present them as a sampler. 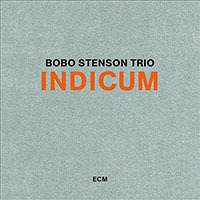 If you have never heard Bobo Stenson on ECM, this is a very good way to hear his work over an almost thirty year period. Selections are from Serenity (3), Dansere (1), Dona Nostra (2), War Orphans (1), The Call [currently unavailable in the U.S.] (1), Leosia (1), Witchi-Tai-To (1), Reflections (1), Underwear [as of now, out of print] (1) and All My Relations (1). See the more detailed descriptions to get an idea of the music created by this remarkable artist. 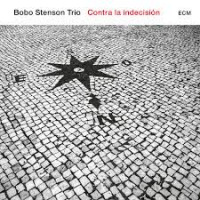 Beginning with the beautiful Silvio Rodriguez tune "Oleo de mujer con sombrero," Stenson almost immediately hits an exposed altered note that dramatically bends the harmony. His trademark way of emphasizing certain notes by dynamics and by the "ghost" notes is on display for everyone to hear in the unaccompanied introduction. Jormin's compositions are represented by "Natt," "Eleventh of January" and "Sediment," and his melodic bass playing style, huge sound and use of vamps and ostinati give structure to the slowly unwinding melodies. Stenson's predilection for the tunes of Ornette Coleman shows with "All My Life" and the title tune, which could be seen as a summary of everything Stenson. The quiet intensity, the sense of large space being created by implying rather than stating, Jormin's arco playing that almost voices harmonics around Stenson's line all add up to deep feelings being expressed. 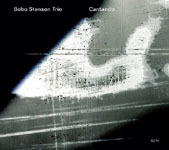 Not a prolific composer, Stenson's "Bengali Blue" seems built out of nothing at first except Jormin's deep bass and Christensen's light yet driven drumming. War Orphans is music that is like pure dark chocolate which melts slowly in your mouth into a rich complexity of flavors. The first record with the trio that will continue with War Orphans, Serenity and Goodbye, Reflections starts off with "The Enlightener" which sounds almost like a "standard" tune at first, but, with the extremely long section on a pedal point, goes off in an entirely unexpected direction.